I spotted the design for this eraser stamp on Kathleen's blog in the December 18, 2005 post. I sketched it and stuck it in my drawer to journal later. Last night I was wondering what to do a page on when I came across the bit of paper and got out my carving tool. I love the colors you've used on this. They're very soothing. These are wonderful pages. So colorful and personal. 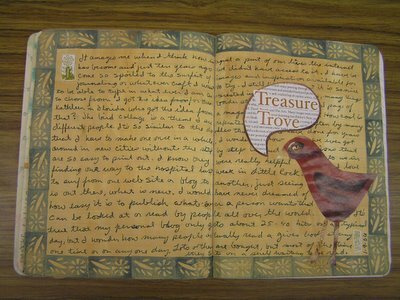 Your journal pages are quite fantastic and I like the way you are going back and forth between drawing, painting, stamping, collaging...I am sure your finished products are lovely with LOTS and LOTs to look at. Thanks everyone. I do enjoy going back through my books. I am working on number 5. There are so many good memories stored in them. My neices like looking too and especially finding their names. Love this border Dawn! The green and yellow look great together too. I really like this spread. 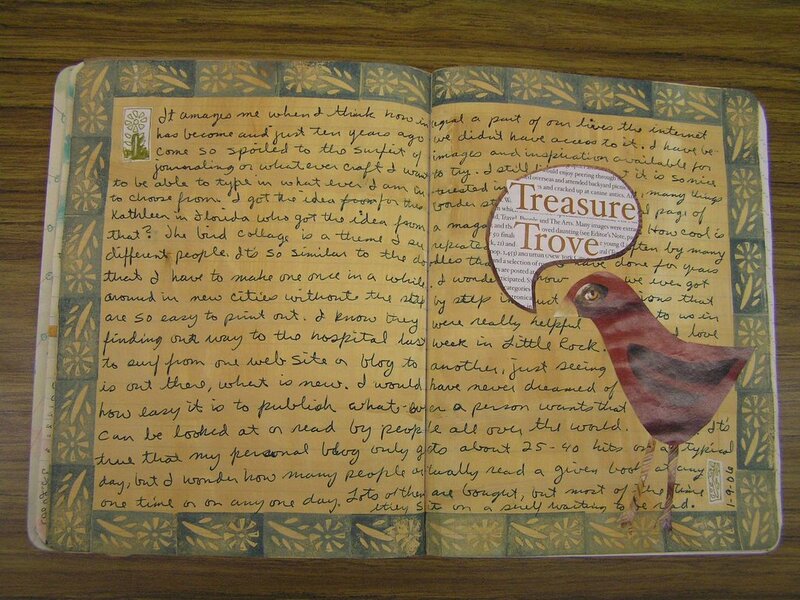 I love the colors and the stamped border. (Makes me want to pull out the half a dozen erasers I bought for stamping purposes and cut away!) The bird is a great touch that really feels like it fits. I can't read your entry, but it all sure looks great as a whole!! !